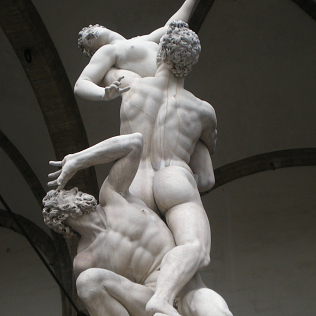 The Kidnapping of the Sabine Women is a marble statue, perhaps one of the most famous of the works exhibited in the Loggia dei Lanzi. The author is Giambologna, Italian name of Jean de Boulogne (1529 - 1603), Flemish sculptor who worked in Italy, especially in Florence. The statue is 4,10 meters high and was placed - along with other masterpieces - in the Loggia by Grand Duke Cosimo I. The Grand Duke created an outdoor museum in the space dedicated - during the Republican period - to the assemblies, in order to show its power and the end of that experience. The work depicts a girl who tries to free herself, while she is raised by a man at whose feet is an old man who despairs. It represents an episode of ancient Roman history, the Kidnapping of the Sabines: Romulus, king and founder of the city, kidnapped Sabine women for the Roman men, in order to give them someone to procreate with. The work represents how that moment was violent and tragic. However, the sculpture has also another definition: The three ages of life. In fact, the older man is overwhelmed by a man, who holds a girl, even younger than him. When he worked on this sculpture, Giambologna, the great master of Mannerism, was the official sculptor of the Medici. For several years, the work has suffered the continuous exposure to atmospheric agents. The scholars are considering a possible transfer to Palazzo Vecchio or the Uffizi.